This monotype is part of a series inspired by thoughts and emotional responses to the color and geometry of the architecture of Umbria, Italy. It was created with Master Printer Taka Maruno at The National Academy Museum and School of Fine Arts in the winter of 2013. In the background layer, Gourlay was exploring different viscosities in the ink combined with a range of densities of color and shape with the foreground layer. She likes the immediacy and experimental quality of monotypes, in addition to the element of surprise. James Panero, The New Criterion, Gallery cronicle, Tempos: Selected Works by Elizabeth Gourlay 2013 - 2015, Fox Gallery, NYC, November, 201 5. Brett Baker, Painters' Table, Elizabeth Gourlay: Vision Images (December 26, 2013), Painting in Connecticut (December 10, 2012) , Elizabeth Gourl ay: Studio Visit (July 2, 2012). 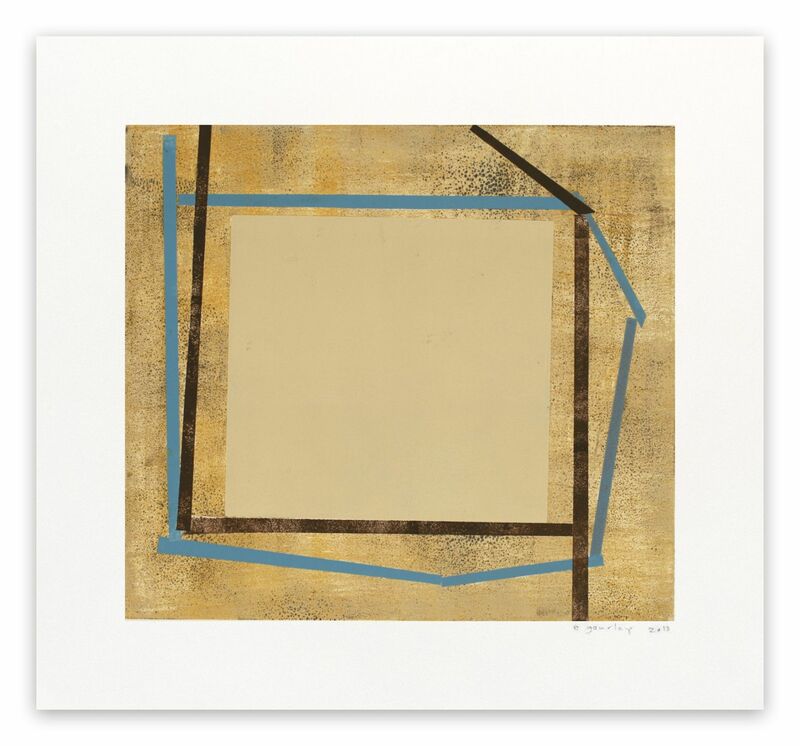 Elizabeth Gourlay is an American abstract artist whose work emerges from a progressive process of layering colour, lines and forms, informed both by inner emotional states and her observation of nature and architecture. She lives and works in Chester (CT). Elizabeth Gourlay studied Drawing and Painting at the Edinburgh College of Art in Scotland where she graduated in 1983, she then went to Yale University School of Art (CT) where she earned an MFA in Painting. 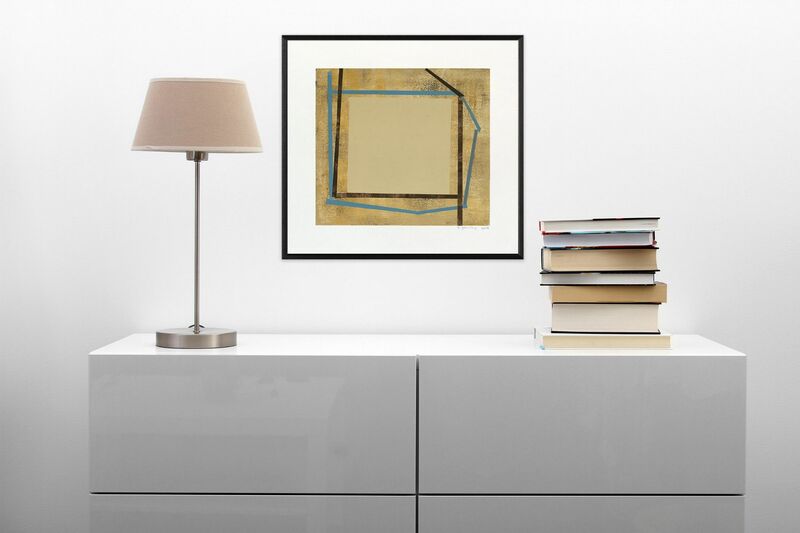 Elizabeth Gourlay uses a wide range of media such as oil, flashe, acrylic, ink and graphite to create artfully simple and strong compositions. Her work usually begins with layering washes of colours, then followed by drawings elements. The colours are sharply and fully selected, using a wide range of colour palettes from almost monochromatic to greatly polychromatic. Her paintings are metaphorical: some of her pieces allude to science by illustrating experiments with coordinate planes and bar graphs. Some refer to music with shapes defining sound and colour defining volume. Furthermore, some paintings suggest history and culture with covering layers of apparent worn or shredded paper. Gourlay thinks of her work as a meditation on colours, lines and forms, leading to a complex network of shifting shapes and colours. "The shapes and lines create my own vocabulary of abstract forms." She has an interest in elements found in nature, architecture and music, drawing lines, grids and geometric shapes to demonstrate it. Indeed, her work is often described by its musicality and architectonic connotations. The use of line suggests influences from Agnes Martin while her play of colour reminds Paul Klee's work. Her compositions deal with order and chaos using a line, colour and shape. Gourlay's work is featured in various private and corporate collections including The Lewitt Collection, The Marriott Family and Yale University. Elizabeth Gourlay has extensively exhibited in solo and group shows on the US East Coast.